8/13/17 Tes did good at answering question about feeding the puppy adult dog food. Because if this I was not well positioned to explain to the vet my decision to do adult dog food and in turn the vet was more convincing as to feeding puppy food I started off feeding puppy food. I further researched and believe I concluded more support for feeding adult dog food to him. I want to be sure his weight and growth is under control for a long healthy life. EB Tes here...symposiums sponsored by AKC; the vet specialists in nutrition spoke, and continue to speak on this fact - "Feed Adult Dog Food to your puppies". 8/14/14 I must share - his personality is incredible! Mike & I were a little apprehensive in what to expect from him, as our Zeus was nearly human to us and we loved that and so dearly hoped Nico would be a little that way too. Well...happily Nico has exceeded our expectations! It's gotta be " big poodle " DNA, we just do not see the same behavior and personalities in our other "standard" standards. 6/8/14 All 10 rating: Tes has done everything with high quality. Her breeding has produced high quality pups. Dealing with tes has been very positive and very professional. 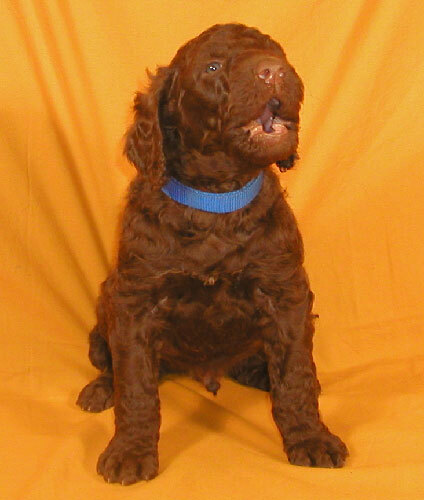 5/9/14 All 10 rating: Web site is very helpful and updated...information we received was always accurate and timely, I am a former breeder and this experience was exactly what was promised. Then, the puppy far exceeded any expectations we had. A professional experience linked to a very personal touch. We absolutely love our puppy. She arrived in excellent condition. Our vet was very impressed with her condition and the quality of the dog. This was an excellent experience from start to finish. Than You Tes for your hard work in delivering a quality experience and a happy, housebroken, heathy puppy. 3/12/13 I just wanted to share with you the joy, we are experiencing with our little apricot female that we named Lady Myralyn. She not only is very healthy across the charts with each visit to the veterinarian, but definitely of royal statue. Her temperament is definitely a delight. Everyone who meets her remarks on her intelligence. As you no doubt already know, standard poodles are highly intelligent, so many blessings await you if you determine to purchase a royal standard poodle from Tes. I am one to research completely a decision as important as acquiring a new member of your family. This is exactly the decision you are making. Tes, in my estimation, is perfection when it comes to breeding. She delivers a healthy, well bred royal poodle with excellent credentials. As a family, we have purchased two royal standard poodles from her. Entirely different parents.....both outstanding. I also believe that Tes is a straight shooter in the arena of discussing your individual pet's personality. You can trust her completely to disclose every aspect of what she has witnessed concerning your chosen offspring. The first poodle we purchased for our daughter has grown into an absolute beauty. She has the classic show-stopping features and stance of her mother, but the royal size of her father. Her temperament exactly as Tes described to us, shy but settled into my daughter's home as majestic in every way at a year old. She shares my daughter's home with an apricot male standard who is seven years old. They love to play and run together! 2/26/13 Score Card completion > all 10's - Typically I'm skeptical about dealing with people I have not met face to face; however, I immediately developed a comfort level with Tes having spoken with her over the phone for the first time. There was sincerity in her voice that assured me I could trust her. From that moment on dealing with her has been a complete pleasure. I shared with her my desires and she worked very hard to meet them. 9/15/07 Service Dog--Scorecard returned survey comments: 1. Did the agent help you understand what steps needed to be taken? *I had a clear picture of what the dog's needs would be and what that meant. 2. If anything; did the agent fully answer your question/s of what you didn't understand? *and continues to answer questions as they come up. 3. Was the agent courteous and friendly at all times? *I would add enthusiastic. She has a product to be proud of and it is reflected by her entire personality. 4. Did the agent do what was agreed? *and more! She went out of her way to make the dog easily available to me--Thank you Tes. 5. Would you recommend Falcon Services to others? *Tes takes her dogs very personally--they are family. • Did TI help you understand what steps needed to be taken? 1 2 3 4 5 6 7 8 9 10 Any comments? • If anything; did TI fully answer your question/s of what you didn’t understand? 1 2 3 4 5 6 7 Any comments? • Was TI courteous and friendly at all times? 1 2 3 4 5 6 7 8 9 10 Any comments? • Did TI do what was agreed? 1 2 3 4 5 6 7 8 9 10 Any comments? Do you have any positive feedback that others could read on the website?